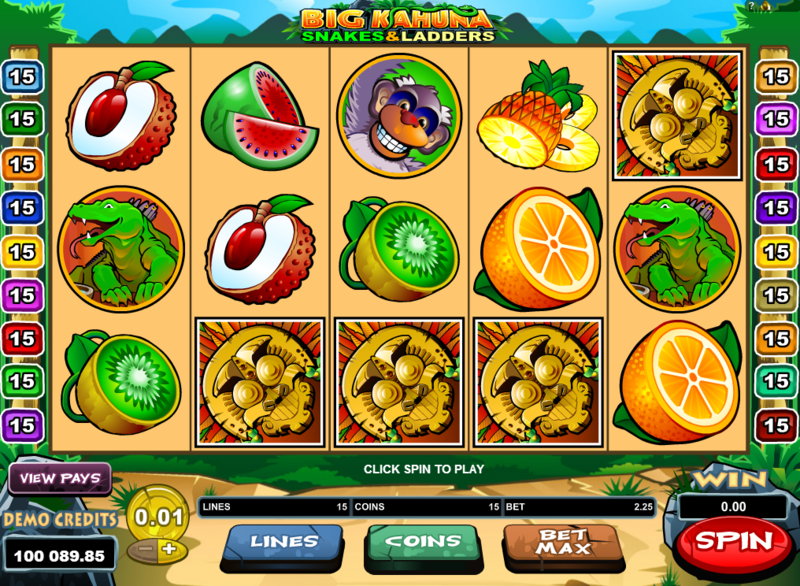 This hilarious slot based on Big Kahuna's version of the classic board game is brought to you by Easy slots. Opening it’s doors in 1994, Microgaming is one of the most progressive game companies in the entire world. After the release of their Viper software in 2002, the company saw itself sail to new heights to both players and their peers alike. Over the past 10 years Microgaming has paid out more than 100 million in jackpots since it’s inception. Now that’s impressive. If you want a great Easy slot games, then look no further than Microgaming. A sequel you never knew you wanted till now, the original Big Kahuna slot was only the beginning in what Microgaming hopes to be a long line of Big Kahuna related endeavours, think Marvel film universe but with online slots and their inter-locking threads that seem to run between many instalments. Released back in 2003, Big Kahuna Snakes and Ladders gives players a chance at even more big cash pay-outs than its predecessor (how very generous of them!). Expect even more pay-lines, free spins and a wide variety of bonus features that is sure to get those reels in a tizzy. It is common knowledge that sequels and second instalments of anything in the public eye tend to be lazy and un-imaginative, here there is an exception to that statement. Big Kahuna Snakes and Ladders takes all of the possible mistakes and advantages of the first and adds even more layers on-top, no simple task fora dev team, but hey with Microgaming at the wheel you need expect anything less from them. Like its older brother, the setting for this game carries on the tradition of being featured on a tropical paradise rife with nothing but peace and serenity around every ridge and corner. The Big Kahuna mask once again looks on from afar as you attempt to use his reels to conjure some rather cheeky cash prizes. This title is idyllic in every sense of the word, the cartoon graphics and paradise-scapes serve as perfect reminders for why so many of us choose to visit other countries all year round. In this instalment of the series you’ll be looking at finding the hidden mask of Big Kahuna which has been stolen and taken atop a mountain, who took the mask is anyones guess but if we had to point fingers and name names then it’s probably them snakes that did it, the same snakes that will constantly try to mess up your perfectly layered reels. This is once again another game of professional snakes and ladders with features giving you more ways to win big or perhaps lose out on certain matches what with those snakes about. Big Kahuna Snakes and Ladders is a step in the right direction for the franchise if you ask us (and our opinion is pretty much gospel so you best believe). The first title in the series had a lot to see and experience whereas the sequel has somehow managed to built upon an already working foundation. Why re-invent the wheel you might ask? Well to create slots like Big Kahuna Snakes and Ladders of-course! Now go play UK slot game!